SAVE THE DATE for InDowncity's annual spring block party on Saturday, May 4th in historic downtown Providence! If you enjoyed Taco Fest, you won't want to miss this new take on our spring event! 🌸 Food and drink vendors, picnic areas! 🌱 Plant sale featuring local farms and florists! 🌸 Gardening tools and tips from area experts! 🌱 Complimentary kids' crafts and activities! 🌸 Music to keep you groovin! During the festivities, Blooming Artisan will be back with our DIY floral crown booth. Come create your own floral crown or floral collar for your fury friends. Floral Crowns will start at just $15/each. PLUS, the 🎸Providence Rock & Roll Yard Sale 🎸returns with over 40 expertly curated vendors selling vinyl records, vintage ephemera, books, handmade jewelry and crafts! This event is FREE, family friendly, and takes place rain or shine. We hope to see you there! Are you looking for a fun and unique way to celebrate Mom this Mother's Day? Bring her to An Unlikely Story for a "DIT" (Do-It-Together) flower arranging party. Think of all of the things you have learned from mom along the way. What if you could teach her something new this Mother's Day...something she could use time and again in the coming years? Jennifer Guerin, owner of Blooming Artisan, will guide you through the arranging process step-by-step. You and your mom will each make a charming flower arrangement to take home with you. All tools and materials will be provided for you. Come and enjoy some quality time together! If you can't make the event with your mom or child that's OK! A handcrafted flower arrangement makes for an extra special gift for someone you love. Or treat yourself and join us for an afternoon of some much-needed "you" time. There will be food and drink available in the cafe. Children are welcome accompanied by an adult. For children 12 and under, it is OK for an adult and child to make one arrangement together. For guests with children, please be advised will be using pruners and scissors. Love the flavors that fresh herbs add to your favorite recipes and cocktails? Wish you had some on hand in your own kitchen? Blooming Artisans is all about herbs, with a DIY – Culinary Herb Planter Party. We’ll provide a range of fresh herbs — you choose your favorites and create a herb planter to take home with you. Don’t have a green thumb? No worries…the instructor does! She is a trained professional who will lead through the arranging process step-by-step. Just come, learn, and enjoy. Herbs and tools are all provided for you. Please bring your own container with you. A planter approximately 12-24” in diameter and 6”-12” tall will work best. Don’t have one? Don’t worry! Containers are available to purchase for an extra $10. Make it a fun time together with friends, family, or your favorite foodie! Advanced registration is required, to ensure we have enough materials for participants! Fairies of all ages can make their own floral fairy crowns before embarking on an exploration through the enchanted forest and discovering whimsical homes of fairies, gnomes, imps, trolls, pixies, elves and all creatures that reside there! Join Blooming Artisan at the Hopedale Parklands for the Hopedale Fairy Walk 2019! Create a special memory. Stop by the Blooming Artisan booth for DIY floral fairy crowns. These beautiful works of art usually take about 15 to 20 minutes and only cost $15. Blooming Artisan provides all the tools and materials needed and will lead step by step. Ladies gather your friends for a special night out to celebrate Galentine’s Day! Studies show having close female friends is good for your health. Getting together at least once a week with your friends can improve your quality of life and reduce stress. It’s also proven doing something together as a group is more fun and solidifies your friendships even more. So let’s join Jennifer Guerin, owner of Blooming Artisan for a fun night out of flower arranging, wine and hors d'oeuvre. Jennifer will guide you through the arranging process step-by-step. You and your friends will each make a charming flower arrangement to take home with you. All tools and materials will be provided for you. A complimentary glass of wine, beer or soft drink and hors d’oeuvres are included. If you can't make the event with your friends that's OK! Treat yourself to some much-needed "you" time and make some new friends. Come and enjoy some quality time together! Jennifer Guerin has been working in the horticulture and landscape industry for nearly 25 years. She has always had a passion and creative flare for cut flowers and creating floral arrangements. However, Jennifer kept this talent somewhat of a secret, only really sharing it with her family and friends. Jennifer enjoyed being able to provide them a unique and special gift, as well as contributing a personal touch to many important events in their lives. It never ceased to amaze her, the joy fresh cut flowers brought to people. Despite the fulfillment she felt, Jennifer never wanted to be a traditional florist. However, in 2015, Jennifer began to think she could bring this joy and creative fulfillment of floral arranging to many people in a different way — something outside of your traditional floral shop. Jennifer observed an increased popularityin trends such as Do-it-Yourself (DIY) projects, websites such as Pinterest, and an ever-growing number of paint and wine nights. These observations planted the seeds that began to form Jennifer's vision for the Blooming Artisan. Visit her website at www.bloomingartisan.com. During the festivities, Blooming Artisan will be set up with a DIY floral crown booth. Come create your own floral crown or floral collar for your fury friends. Crowns will start at $10/each. Enjoy the local flavors, sights and sounds of Providence as we gather on Westminster Street in Downcity to celebrate the return of warm weather... and all things TACOS. DJ Studebaker Hawk will be mixing eclectic Latin beats from Grant's Block to get you moving in between chowing down on delectable bites from some of your favorite local eateries. This family-friendly event includes a kids' craft table, sidewalk chalk, masks, and other complementary activities for kiddos of all ages. Succulent Pumpkin Centerpieces are a popular fall favorite. This will be one of the last opportunities of the season to make your own. We will top real pumpkins with live succulents. It is a unique and simple arrangement that will easily last to Thanksgiving. You can even replant the succulents after the fall to extend their lives and your enjoyment. No worries if you don't have a green thumb — Blooming Artisan will lead you through, step-by-step. Make it a fun morning out with friends or family! All tools and materials will be provided for you. Come anytime in between 11 AM and 2 PM. Allow about an hour to create your pumpkin succulent centerpiece. Although walk-ins are welcome, advance registration is encouraged as supplies are limited. Advance purchases are $40 per pumpkin and walk-ins are $45. Blooming Artisan will be at Franklin Farm, with our very popular festive fall succulent pumpkin centerpieces. Blooming Artisan will be at Seven Cedars Farm Fall Festival, with our very popular festive fall succulent pumpkin centerpieces. In addition, there will be other vendors, petting zoo, crafters, food, inflatables, family fun! Blooming Artisan will be at the 30th Annual Apple Festival with Succulent Topped PumpkinCenterpieces for sale. They are a popular fall favorite. Real pumpkins are topped with live succulents! It is a unique and simple arrangement that will last from Halloween to Thanksgiving. You can even replant the succulents after the fall to extend their lives and your enjoyment. The Apple Festival draws over 5,000 people over the weekend and fills Johnston Memorial Park with music, laughter and the scent of apple pies and great food. Blooming Artisan will be at PVD Flea - June 11th and 25th with a DIY Booth all about succulents. Bring a planter, buy a planter from Blooming Artisan or find a treasure from one of the other Flea vendors, then stop on by to plant it up! We might even have a special DIY succulent craft for you! Stay tuned for more updates. Love the flavors that fresh herbs add to your favorite recipes and cocktails? Wish you had some on hand in your own kitchen? Jennifer Guerin of Blooming Artisan in partnership with Patsy Culp of And Celebrate invite you to celebrate the official start to summer with a DIT (do it together) Culinary Herb Planter and Cocktail Tasting Party at Candita Clayton Gallery. A range of fresh herbs will be provided — some for sipping, some for planting. You choose your favorites and create a herb planter to take home with you. Don’t have a green thumb? No worries…Jennifer does! With over 25-years in horticulture, she'll lead you through the arranging process step-by-step. Gather your friends, sip on freshly crafted cocktails, learn, laugh, and enjoy. All tools and materials are provided for you. If you prefer to use your own container, please bring it along. A planter approximately 12” in diameter and 6”-12” tall will work best. Don’t have one? Don’t worry! There are two ticket options - with or without a container. This special night includes cocktail demonstration and tasting inspired by our DIT herb planters. Snacks will be served to compliment our cocktails. Join Blooming Artisan at New Bedford JazzFest for a very popular floral crown making event. Stop by anytime between 2 PM and 7:30 PM to make a floral crown. A typical floral crown usually takes about 15 to 20 minutes. These beautiful works of art only cost $10. Join Blooming Artisan at the arcade providence for the Arcade Vintage & Artisan Stroll - PVD Fest for a very popular floral crown making event. Stop by anytime between 11 AM and 6 PM to make a floral crown. A typical floral crown usually takes about 15 to 20 minutes. These beautiful works of art only cost $10. Are you looking for a fun and unique way to celebrate Mom this Mother’s Day? Bring her to Candita Clayton’s Gallery for a “DIT” (Do-It-Together) flower arranging party. Jennifer Guerin, owner of Blooming Artisan, will guide you through the arranging process step-by-step. You and your mom will each make a charming flower arrangement to take home with you. All tools and materials will be provided for you. Come and enjoy some quality time together! If you can’t make the event with your mom or child that’s OK! A handcrafted flower arrangement makes for an extra special gift for someone you love. Or treat yourself and join us for an afternoon of some much-needed “you” time. We'll be serving up afternoon tea and bubbly mimosas along side macaroons from Ellie’s Bakery. Advanced registration is encouraged to ensure we have plenty materials for participants. Tickets are $55 per person - but take advantage of EARLY BIRD registration and SAVE $5 per ticket if purchased by May 6th. Check out the Mom & Me package which offers even greater savings! Create a lasting family memory with a hands-on experience featuring Fairy Gardens that you can make and take. Fairy Gardens are magical and whimsical miniature gardens that capture the imagination of children and adults alike. Advanced registration is encouraged, to ensure we have enough materials for participants! Tickets are $45 per person — but take advantage of EARLY BIRD registration and SAVE $5 per ticket if purchased before April 14th. Check out the family packages which offer even great savings! Celebrate National DIY Day on April 2 with Blooming Artisan! We’re excited to be hosting a hands-on experience featuring Fairy Gardens that you can make and take. Roll up your sleeves for some much-needed “you” time, or and create cherished family memories with a Do-It-Together activity in the name of a good cause! A portion (20%) of the event’s proceeds will be donated to AdoptAClassroom.org. Advanced registration is encouraged, to ensure we have enough materials for participants. However, walks-in are welcome while supplies last! Tickets are $35 per person at the door — but take advantage of EARLY BIRD registration and SAVE $5 per ticket if purchased before March 31. Our family packages offers even great savings! As a National DIY DAY ambassador I am proud to support AdoptAClassroom.org and their mission to give teachers a hand by providing much-needed classroom materials so that their students can learn and succeed. National DIY DAY and Blooming Artisan are committed to supporting classrooms and providing tools for students and teachers to enhance the creative learning experience. Support AdoptAClassroom.org by Texting a Donation Today! Text the word "Give" to (678) 582-8594 and you will be prompted through a secure system to make a donation of your choice! Join your friends and family for a special morning creating your very own personalized terrariums! No worries if you don't have a green thumb - Blooming Artisan's party instructor will lead you through, step-by-step. All tools and materials will be provided for you. This event is being hosted at the lovely Bradley Estate in Canton, MA. We'll begin getting our hands dirty and building our terrariums at 11:00 a.m. Advanced registration is encouraged, to ensure we have enough materials for everyone who wishes to participate. Join your friends and family for a special night out creating your very own personalized terrariums! This event is being hosted by Blooming Artisan at Roger's Family Restaurant, Somerset, MA. Food and drink are available for purchase. Or make it a fun night and stay for dinner. We'll begin getting our hands dirty and building our terrariums at 7:00 PM. Advanced registration is encouraged, to ensure we have enough materials for everyone who wishes to participate. Tickets are $40 per person — but take advantage of EARLY BIRD registration and SAVE $5 per ticket if purchased before March 1st or the friends' package for even great savings! Looking for a fun family event for school vacation week? Gather your family for a special night out creating your very own personalized terrariums! This event is being hosted by Blooming Artisan at The Empowerment Factory. You are welcome to bring your own refreshments. We'll begin getting our hands dirty and building our terrariums at 6:30 PM. Advanced registration is encouraged, to ensure we have enough materials for everyone who wishes to participate.Tickets are $40 per person — but take advantage of EARLY BIRD registration and SAVE $5 per ticket if purchased before February 16th or the family package for even great savings! Advanced registration is encouraged, to ensure we have enough materials for everyone who wishes to participate.Tickets are $40 per person — but take advantage of EARLY BIRD registration and SAVE $5 per ticket if purchased before February 16th or the friends' package for even great savings! Valentine Fundraiser at The Empowerment Factory during the Saturday's indoor Pawtucket Wintertime Farmer's Market. On Saturdays, February 4th and 11th, 9 AM to 1 PM. Blooming Artisan will be doing Make & Terrariums starting at $20 for 1 terrarium and $15 per terrarium for 2 or more. Come buy your valentine a gift, buy a card, make a card, make a long-lasting terrarium with all proceeds going to support The Empowerment Factory's community-based programming and classes for students of all ages. Also, there will be raffles, gift certificates, and other prizes. The Empowerment Factory is investing in the people of our community to give them the tools they need to succeed. Show you care about community and life long learning by making a fully tax-deductible contribution when you stop in to buy your Valentine's Day gift. We have a goal of $5,000 which will enable us to run 20 educational workshops. Some of the great happening that day is "Do-It-Together" terrarium making with Blooming Artisan. Card making with artist Gail Ahlers, ready to go gifts of jewelry, gift certificates, books, and flowers. Join in to support this community learning center as we work together to build healthier, happier and more empowered people. We thank you for your support. Advanced registration is encouraged, to ensure we have enough materials for everyone who wishes to participate. Tickets are $40 per person — but take advantage of EARLY BIRD registration and SAVE $5 per ticket if purchased before February 3rd or the friends' package for even great savings! Join your fellow Orangetheory Fitness members for a night out "DIT" (Doing-It-Together) creating your very own long lasting personalized terrariums. 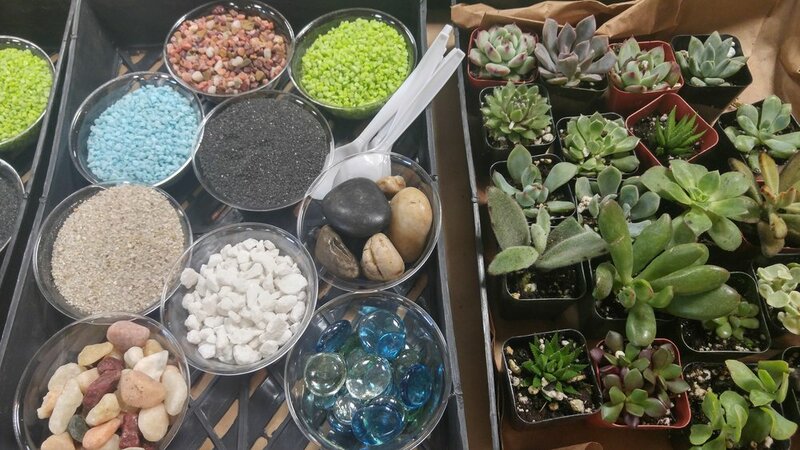 We'll begin getting our hands dirty and building our terrariums at 6:15 p.m.
Bring a friend and purchase the friends' package for even great savings! Get together with your friends and family for a special night out creating your very own personalized terrariums! This event is being hosted at Blooming Artisan at Boldacious Creations,. Bring your own refreshments, beer or wine and snacks to enjoy. Tickets are $40 per person — but take advantage of EARLY BIRD registration and SAVE $5 per ticket if purchased before January 20th or the friends' package for even great savings! Join your Groundwork's friends and coworkers for a special night out creating your very own personalized terrariums! This event is being hosted at Groundwork co-working space. Arrive around 5:30 for a little socializing with your friends and coworkers. Bring your own refreshments, beer or wine and snacks to enjoy. We'll begin getting our hands dirty and building our terrariums at 6 PM. Tickets are $40 per person — but take advantage of EARLY BIRD registration and SAVE $5 per ticket if purchased before January 9th or the friends' package for even great savings! Mix and mingle with friends and family while creating a custom winter holiday centerpiece. The arrangement will be perfect for you dining room table or as a hostess gift. We will be incorporating natural seasonal elements such as fresh cut greens, flowers, pinecones and seedpods for your own unique, festive arrangement to take home. Blooming Artisan is hosting this event at The Empowerment Factory. You are welcome to bring your own drinks and snacks to enjoy. FYI - The Empowerment Factory is located at the Hope Artiste Village. Just down the hall, there is the Hope Village Kitchen. You can come early and stay afterwards to enjoy dinner, snack or your favorite cocktail! Advance registration is encouraged as space is limited. Tickets are $50 per person - but take advantage of EARLY BIRD registration and SAVE $5 per ticket if purchased before December 13th! Blooming Artisan will lead you through step-by-step, and all tools and materials will be provided for you. Blooming Artisan is hosting this event at Boldacious Creations. You are welcome to bring your own drinks and snacks to enjoy. Advance registration is encouraged, as space is limited. Tickets are $50 per person — but take advantage of EARLY BIRD registration and SAVE $5 per ticket if purchased before December 9th! Advance registration is encouraged, as space is limited. Tickets are $65 per person — but take advantage of EARLY BIRD registration and SAVE $6 per ticket if purchased before November 25th!